Deception Pass State Park is the most popular state park in Washington. Every year nearly one million people cross the iconic Deception Pass Bridge that separates Fidalgo Island from Whidbey Island. From the top of the Deception Pass Bridge, visitors are treated to breathtaking views of the Strait of Juan de Fuca, the Olympic mountains, the San Juan Islands, and the dynamic waters of Deception Pass. Kayaking in the Deception Pass area gives you a unique experience of the area that you can not come close to exploring by land. The Deception Pass bridge was completed in 1935. It is actually two bridges, Pass Island sits in between Fidalgo and Whidbey Islands and creates two waterways, Canoe Pass and Deception Pass. At the turn of the century there was a push to create the bridge to facilitate traveling between the islands. The matter was not settled too quickly though due to opposition from advocates of the Deception Pass ferry which was the original means of transport. Eventually practicality won over and in 1933 the Washington State legislature voted to begin the construction. The end result of the construction created a bridge that was over a quarter of a mile long (1487 feet), and 180 feet above the waters of Deception Pass. It’s a fairly narrow bridge at only 28 feet wide, especially considering that about 20,000 cars pass over it every day. On windy days it can feel even narrower still if you are caught passing by a semi-truck just inches away! The sidewalks of the Deception Pass Bridge are 3 feet wide, offering plenty of space for walking across to take in the views. The human history of the Deception Pass dates back over 6,000 years, when the first people settled in the areas now known as Cornet Bay, Bowman Bay and Rosario Beach. A year round village was located in Bowman Bay because Rosario Beach proved to be too unpredictable as a canoe launching point when storm-driven waves ravaged the shore. Eventually, the land was settled by the Samish and the Swinomish who lived on the land until the early 1900s. During his Northwest coastal explorations, Captain George Vancouver became the first European to identify the area near Whidbey Island as a passage, which he named “Deception Pass. The name “Deception Pass” derived from Captain Vancouver’s realization that what he had mistaken for a peninsula was actually an island. He named that island “Whidbey” in honor of his assistant, Joseph Whidbey, who was at his side when Vancouver realized the mistake. The captain named the inlet at which he was anchored “Deception Pass” to commemorate the error. From the top of the Deception Pass bridge visitors are treated to gorgeous views of the Strait of Juan de Fuca, the Olympic mountains, and the San Juan Islands, while below them the swift moving water churns itself into a frothy mosaic of upwellings, tide-rips, and whirlpools. The turbulence is caused by enormous volumes of water passing through the Deception Pass Narrows which separates the islands. At peak tidal currents the velocity of the water can exceed 8 knots! Deception Pass has more than its fabled turbulent water to draw visitors here though. The state park that encompasses Deception Pass is a 4,134 acre piece of amazingly attractive land. It has rugged cliffs, towering trees, sandy beaches, and gorgeous views which bring people here to recreate all year long. With 77,000 feet of saltwater shoreline (that’s 14.5 miles! ), and 33,900 feet of freshwater shoreline on three lakes, there is plenty of room for everyone. Watching the Sun setting over the San Juan Islands is a popular activity for locals who visit Deception Pass. Every evening in the summer months the parking lot at West Beach in Deception Pass State Park fills up as folks unload their barbeques and coolers to enjoy the evening. The protected beach in Bowman Bay, on the north side of Deception Pass, is a favorite for families and people who want to rent kayaks or paddleboards. Although Deception Pass State Park is famous for its outstanding marine views, the walking trails are also a popular draw. 38 miles of hiking trails wind their way through ancient forest to open hilltops and seaside overlooks. There are also 1.2 miles of ADA hiking trails, and 6 miles of horse trails. We’ve spent many years exploring the nooks and crannies of Deception Pass State Park, and we are still discovering new things! Because of Deception Pass’ proximity to the Strait of Juan de Fuca and the Skagit River, and due to the ever churning waters of the Deception Pass Narrows, the area is abundant with wildlife. Over 174 species of birds have been recorded in Deception Pass State Park. 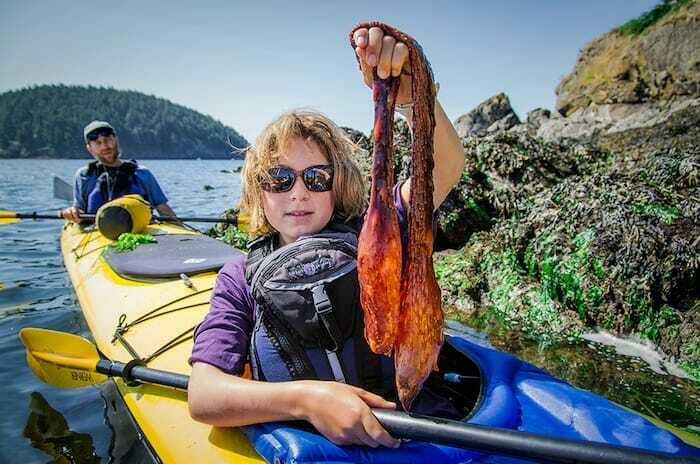 The marine life is unparalleled in the San Juan Islands region. Porpoise, seals, Great Blue herons, Bald eagles, and otter are commonly seen here, and every summer Orca whales patrol offshore waters looking for prey. The salmon fishing can be great as well. Lines of fisherman can be seen along the shoreline under the Deception Pass Bridge during the peak times of the salmon runs. If a guided sea kayak tour is not in your plans then there is an opportunity to rent paddleboards and sit-on-top kayaks from the concession in Bowman Bay. Head out to explore on your own, just stay away from the Narrows! The amenities at Deception Pass State Park are comparable to many National Parks. The park has 167 tent sites, 143 utility spaces, five hiker/biker sites, two dump stations, seven restrooms (four ADA) and six showers (four ADA). Camping is at three locations in Deception Pass State Park; 18 tent sites and two utility sites are at Bowman Bay, two tent sites and 58 utility sites at Sunrise Resort and 147 tent sites and 83 utility sites are at Cranberry Lake. Maximum site length is 60 feet (may have limited availability). These sites are sure to fill all summer long and so reservations are required. 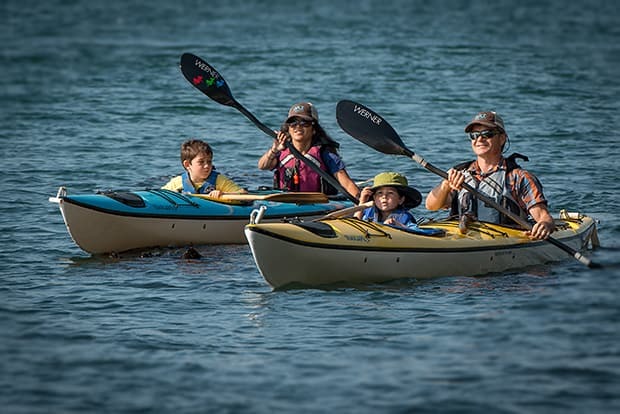 Our family-oriented Deception Pass sea kayaking tours depart from the protected waters of Bowman Bay. Located on the north side of the Deception Pass Bridge, Bowman Bay is a favorite among locals as a picnic area, and among sea kayakers as a launching point for kayaking and exploring the waters around Deception Pass. Our tours avoid the turbulent currents in the Narrows of Deception Pass, choosing instead to explore the gorgeous shoreline along Rosario Beach, and the sea cliffs to the north of the Park. The combination of the currents of Deception Pass and the proximity to the Strait of Juan de Fuca means that wildlife is abundant on these trips. Harbor seals, porpoise, Bald eagles, and Peregrine falcons are just a few of the animals commonly encountered on our tours. These trips are 1.5 hours in duration, a length that virtually anyone can do, regardless of your age, strength, or ability. While we welcome walk-ups, these trips do tend to fill early during the busy summer months. We highly recommend making advance reservations. If sea kayaking is not of interest to you then you can also rent stand-up paddleboards, or sit-on-top kayaks, and explore the area on your own. Call us at (800) 992-1801 or reserve your kayak tour online. Whatever your plans are while you are visiting Washington State, or if you are lucky enough to live here, you owe it to yourself to experience this natural treasure. Deception Pass State Park has something for everyone.